St. Walburga Feb 25 ( Hist. ) Born in Devonshire, about 710; died at Heidenheim, 25 Feb., 777. She is the patroness of Eichstadt, Oudenarde, Furnes, Antwerp, Gronigen, Weilburg, and Zutphen, and is invoked as special patroness against hydrophobia, and in storms, and also by sailors. She was the daughter of St. Richard, one of the under-kings of the West Saxons, and of Winna, sister of St. Boniface, Apostle of Germany, and had two brothers, St. Willibald and St. Winibald. 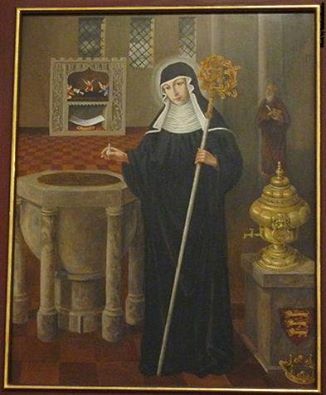 St. Richard, when starting with his two sons on a pilgrimage to the Holy Land, entrusted Walburga, then eleven years old, to the abbess of Wimborne. In the claustral school and as a member of the community, she spent twenty-six years preparing for the great work she was to accomplish in Germany. The monastery was famous for holiness and austere discipline. There was a high standard at Wimborne, and the child was trained in solid learning, and in accomplishments suitable to her rank. Thanks to this she was later able to write St. Winibald's Life and an account in Latin of St. Willibald's travels in Palestine. She is thus looked upon by many as the first female author of England and Germany. Scarcely a year after her arrival, Walburga received tidings of her father's death at Lucca. During this period St. Boniface was laying the foundations of the Church in Germany. He saw that for the most part scattered efforts would be futile, or would exert but a passing influence. He, therefore, determined to bring the whole country under an organized system. As he advanced in his spiritual conquests he established monasteries which, like fortresses, should hold the conquered regions, and from whose watch-towers the light of faith and learning should radiate far and near.